We know that labour and birth tend to be quicker, easier and more enjoyable when women stay at home. When you are calm and comfortable in your surroundings your body produces a natural hormone known as the ‘Happy Hormone or Love Hormone’. This hormone is very important during love making and in birth. However, it is also a ‘shy hormone’ and doesn’t flow well in strange or unfamiliar environments or when you are stressed. For this reason, many of our mums choose a home birth and if this is your choice, we will allocate a midwife to you who is expert in caring for mums at home. She will bring all the equipment she needs to care for you and baby safely. She will know you well, having provided your antenatal care and discussed your wishes with you. Your midwife will be very attentive and should there be any indication at all that things are not going as planned, she will detect this straight away and arrange for you to go to hospital. She will stay with you at all times. The Royal College of Midwives and The Royal College of Obstetricians & Gynaecologists both support home birth for women with uncomplicated pregnancies as it may actually provide several benefits. There is evidence to show birth at home increases the chance of normal, non-intervention birth. It is normally a safe option for women and improves the physical and psychological well-being of mum. Would you like a your very own brand new birthing pool at home? This really is the ultimate combination for a normal, relaxing, positive birth. We can arrange all of this for you. We can also arrange for gas & air to be available for you, just in case you need a little bit of extra help. 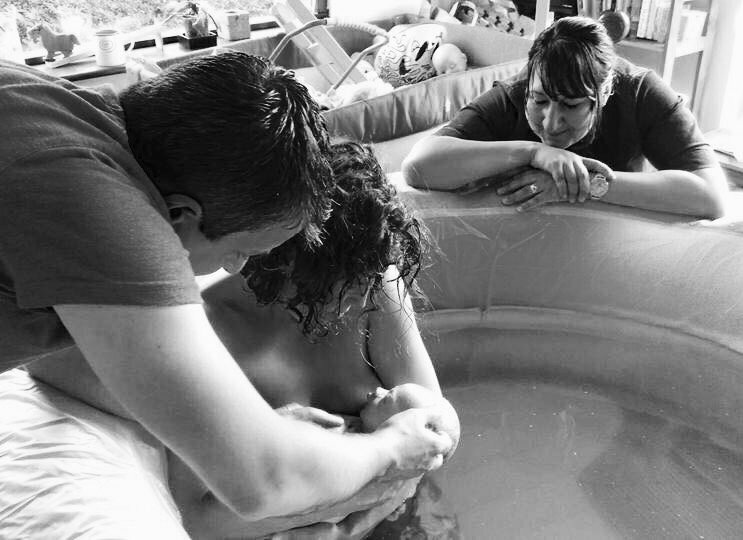 Do you want a home birth but your partner is worried? We have male midwives who specialise in supporting dads through home birth. If you would like us to arrange a man-to-man chat for your partner, give us a call. What's included in the Home Birth Package? Your midwife is on call and available to support you during home birth from 36 weeks and 5 days of pregnancy. (Prior to this, a hospital birth may be advised. Your midwife or her colleague will still be there to support you). There is no way of removing every risk in childbirth. Although the vast majority of babies are born safely, the final outcome of any birth is always uncertain. Evidence does suggest that it is not necessarily safer for birth to take place in hospital, even for a first time baby, so it is worth considering carefully which is the right choice for you. Different factors such as your health, age, whether you have any problems in pregnancy and what choices are available to you, will help to determine the most appropriate place of birth. The most important thing is to discover all the possibilities, to consider what your priorities are and then make a choice which feels right for you. There are many advantages to a homebirth. In your own home you are the centre around which everything else revolves, rather than a patient dependent on the routines of a large institution. Your attendants come to your home as guests. You can relax in the comfort and security of a familiar atmosphere, with your loved ones around you. The birth is an event in your family life, a special occasion, a time to celebrate. For the other children in the family, particularly if they are very young, a homebirth is of great value as they can welcome their new brother or sister without having to cope with a separation from you. For some woman ‘home birth’ is their ideal, but an unexpected complication could arise even for the most healthy and well prepared, and this is when many women want the reassurance that they are in an environment where medical care can be summoned quickly and efficiently.